This is where Independence Highway runs into U.S. 20, the Albany Corvallis Highway. It’s a tricky place for making left turns on to 20, toward Albany, as one of these trucks is waiting to do. But improving the junction is not among the first safety projects ODOT has been planning for this road, used by up to 20,000 vehicles a day. And whether this trouble spot will be fixed with additional funding authorized by the 2017 legislature has not been decided. 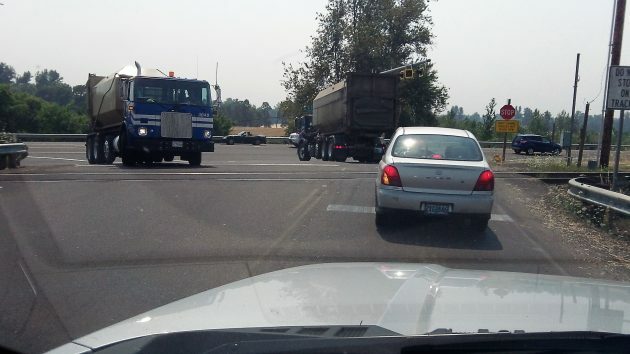 A safety study done for ODOT last year recommended several projects. For the Independence Highway junction, it recommended installing a warning system telling drivers “side street traffic approaching;” better railroad crossing markings and warning signs, improved bike lanes through the intersection, and a left-turn acceleration lane on 20. That lane would make left turns easier and safer. So far ODOT has identified four projects for construction, not including anything at Independence Highway. They are a two-way turn lane between the Children’s Farm Home and Merloy with a tentative construction date in 2020; a left-turn acceleration lane at Granger and shoulder widening between Garland Nursery and Granger (2020-2021); better curve warning signs all along the 11-mile highway (2021); and signal upgrades at Circle and Conifer in Corvallis (2020-2021). In House Bill 2017, the big transportation package raising fuel taxes and vehicle fees, the legislature authorized $20 million for additional work recommended in the US 20 Safety Study last year. What about the Independence junction? Simple solution: No left turns from Independence Hwy. onto Hwy. 20. Thanks for writing about this, Hasso. We live on Springhill Dr and have noticed a significant increase in the traffic, specifically trucks. Most of the trucks come on to Springhill by turning off Independence Hwy at the north end of Springhill. They do this because it is almost impossible for trucks to negotiate the left turn onto Hwy 20 at the end of Independence Hwy. We are convinced that installing a stop light and sensors before and after the railroad tracks would encourage trucks to stay on Independence Hwy and not onto Springhill, which becomes very residential as it approaches Hwy 20. My solution is to connect Granger into Independence Hwy. and install a stop-light traffic signal there. It would give priority to east-west traffic and only stop traffic to allow for left turns. ODOT planners probably don’t want to stop Hwy 20 if possible. Granger traffic turning east (left) onto 20 would then be blocked (only right turns allowed). Add a west-bound acceleration lane here. Looking at the Bright Side…. …at least the shameful, political campaign graffiti has been painted over on the adjacent structure.